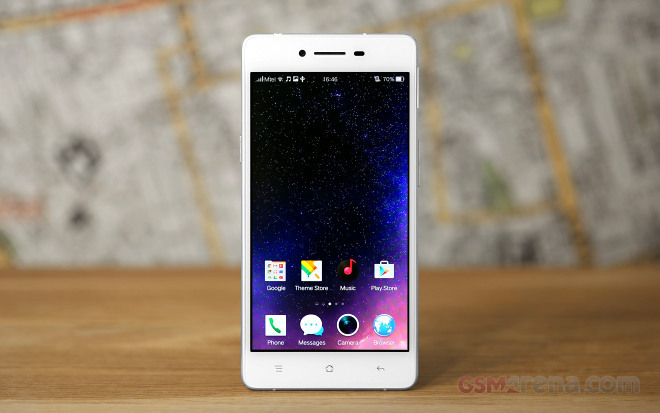 The Oppo R7 keeps the same key hardware specs – a 5″ AMOLED 1080p display, the same Snapdragon 615 chip, this time around with 3GB of RAM, and runs on the aging Android KitKat. The older Oppo R5 returned a disappointing endurance rating and we hope Oppo managed to fix this issue for the successor. Our first test gauges the 3G talk time performance. The Oppo R7 did splendid with an excellent endurance of 23 hours. That’s double the R5 rating and then some. The web browsing battery drainage has been improved from the disappointing 4 hours on the R5 and now the R7 can last 7 hours and 22 minutes hooked up on our web script. This is a significant improvement once again, though it’s only average among all phones. The video playback turned almost twice better too – the R7 lasted 9 and a half hours before its battery went down to 10% – 4 hours up from the Oppo R5. This is enough for you to enjoy 4 full-length movies. The single-SIM and dual-SIM standby performance turned both good though not impressive- if you use the Oppo R7 with just one SIM card it will last about 9 days on standby. Opting for a dual-SIM setup will lower the standby endurance to 7 and a half days. 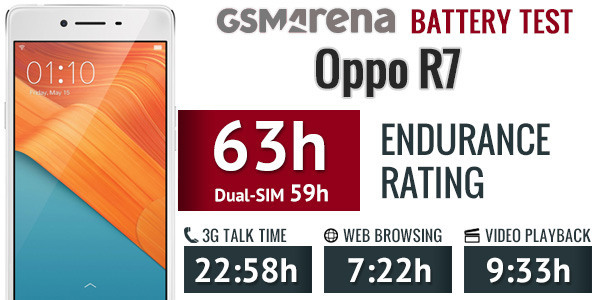 So, the great 3G call time score, the improved web and video endurances, plus the average standby ratings led the Oppo R7 to a 63 hours total endurance rating on a single-SIM setup and 59 hours dual-SIM rating. This means you will be able to use the Oppo R7 about two and a half days on a single charge, if you are doing an hours of 3G talks, web browsing and video playback each day.